Bienvenida guerrera, llegaste a casa. Welcome, warrior. You’ve reached your shelter. This is the message that Dr. Cynthia Villarreal delivers to all of the young women who come to her seeking supportive services as they battle against breast cancer. Young women with breast cancer are found to be more vulnerable to emotional distress and psychosocial problems, requiring special supportive interventions. Formerly a GCI scholar, Cynthia has made it her mission to provide care and comfort to this specific cohort of cancer patients, helping them to navigate this life-altering diagnosis. In the United States, the median age of all breast cancer patients is 62, with only 5% of patients under 40 years of age. In Mexico the average breast cancer patient is only 51 years old, with 15% of patients falling under the threshold of 40 years. Although there are more young women with breast cancer in this middle-income country, supportive services are scarce. Comprehensive programs for young breast cancer patients have been conducted, but these programs have been piloted predominantly in developed countries, such as USA and Canada. 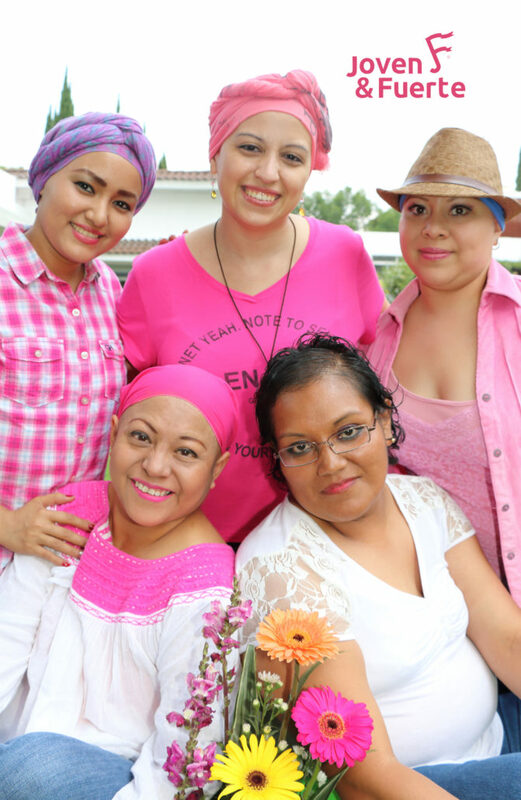 This scarcity is what prompted Cynthia to create Joven & Fuerte: a Program for Young Women with Breast Cancer in Mexico, providing support and care to young women in their fight against breast cancer. Joven & Fuerte, meaning “young and strong” in English, is the first program dedicated entirely to the care of young breast cancer patients in Latin America. Taking place at both the Instituto Nacional de Cancerología and the Instituto Tecnológico y de Estudios Superiores de Monterrey, Joven & Fuerte aims to provide its patients with a variety of supportive services, such as psychological testing and genetic testing, fertility provision services, referrals to surgical reconstruction specialists, and access to multilingual educational materials. Joven & Fuerte aims to provide fertility, genetic, and psychological supportive services to young women who have breast cancer, a life-altering diagnosis that can be difficult to navigate. Patients receive support and guidance through services such as genetic testing, clinical and psychosocial care, and referrals to reconstructive surgeons and fertility specialists. In addition to molding strong survivors out of their young patients, Joven & Fuerte strives to create a motivated and empowered community. One of the ways they do this is by providing Spanish-language educational resources for young Mexican patients, as well as material for healthcare providers. Additionally, some of the women in Cynthia’s program serve as pilot members of targeted research, research which will be used to develop better programs and services for patients like themselves. A cohort of young breast cancer patients are studied regarding their physical, mental and emotional health (at baseline and during follow-up), and data collected from this research initiative then serves as a guide for the development of cultural-specific interventions addressing this vulnerable group. Unfortunately, limited initiatives have been taken in low- and middle-income countries to address the particular issues facing young women with breast cancer. In Mexico, a middle-income country with significant socioeconomic limitations, cancer control efforts are predominantly directed to enhance medical care, while survivorship issues have not been a priority. Due to scarce funding, deficient training among providers, and lack of awareness regarding the precise needs of young patients – needs that might vary depending on different socio-cultural backgrounds – breast cancer survivors do not have the tools to rebuild their physical, social, professional, and personal well-being. Joven & Fuerte provides all patients with a Program Navigator to assist them with their specific needs. The Program Navigator meets with the patient, introduces the program, and discusses the issues that might be important to young women with breast cancer, identifying the patient’s special needs. This facilitator subsequently assists the patient, making referrals to fertility specialists, genetic counseling and emotional supportive services, as they find appropriate. In addition, the navigator supplies printed educational material and access to online resources specifically created and adapted for young Mexican patients. In order to deliver specialized care, such as fertility assessment and genetic counseling, Joven & Fuerte collaborates with several local alliances. This collaboration helps Joven & Fuerte with reproduction center referrals, as well as offering possible fertility preservation strategies, partially or totally covering the procedures’ costs. As for implementing genetic cancer risk assessment, the program has partnered with national and international collaborative institutions to offer genetic testing as part of research initiatives, which has allowed Joven & Fuerte to overcome the highly expensive and inaccessible costs of genetic testing. Additionally, collaborations with non-governmental organizations are being established to partially or totally cover reconstruction surgery, as the public health care system does not include such procedures as a component of breast cancer treatment. Where does GCI come in? This project has been conducted through a joint effort with three key international collaborators: the Program for Young Women with Breast Cancer at the Dana Farber Cancer Institute, the Global Cancer Institute, and the Division of Clinical Cancer Genetics at City of Hope Hospital. The program at Dana Farber has been essential, serving as a reference and guide for Cynthia and her team. The Global Cancer Institute has assisted in the development and maintenance of an electronic database for the registry of clinical characteristics and outcome data for research purposes. Lastly, the Division of Clinical Cancer Genetics at City of Hope Hospital has served as a major partner to strengthen the genetic cancer risk assessment of patients. In Mexico, up to 15% of the total number of newly-diagnosed breast cancer patients are detected at or before 40 years of age. From November 2013 to February 2017, 265 of these patients have been enrolled in the Joven & Fuerte program. 18 (7%) of those patients were referred for timely fertility preservation (with partially or totally covered costs), and 236 (89%) received genetic cancer risk assessment, testing for genetic mutations. All patients completed psychological evaluations and 110 (42%) received psychological support. 12 seminars and 16 workshops related to specific topics of interest for young women and their families have taken place. Also, 8 focus groups were undertaken for assessment of young Mexican patients’ needs, with the purpose of developing educational materials specifically targeted to address those identified concerns. What’s more, the Joven & Fuerte program developed and adapted the first Spanish-language resources exclusively dedicated to Mexican young patients by creating an educational manual, fact sheets, infographics, website and mobile application. The online materials can be accessed through the web-address jovenyfuerte.com.mx. As for research productivity, eight peer-reviewed manuscripts have been published and seven international abstracts presented regarding Cynthia’s project. During this period, Joven & Fuerte has been awarded with four grants: CONACYT (National Council for Science and Technology), Mexico; Fundación CIMAB, Mexico; Susan G. Komen for the Cure, USA and Avon, Mexico. Funding is a constant struggle for continuity of Joven & Fuerte, which currently mostly relies on limited grants to financially support its activities. The latter conveys two major potential problems: first, lack of sustainability and risk of discontinuity, and second, vulnerability to patient saturation because of limited human and material resources. In order to combat this scarcity of funds, Joven & Fuerte seeks out people and organizations with similar interests, establishing both inter-institutional and international connections. By recruiting groups that are deeply motivated and interested in studying breast cancer in young women and the needs of these women, Joven & Fuerte is making it’s mission a reality. It is intended that the organization and structure of this pilot program will serve as a model for health centers in other Latin American countries. The Avon-Mexico grant is designated to guarantee the reproducibility of the Program in five additional centers across Mexico, which Joven & Fuerte sees as just the beginning. The ultimate goal of Joven & Fuerte is to replicate its program model in other health care centers across Mexico, and eventually, it is intended that the program can and serve as platform for other countries. Cynthia’s mission is to provide care to as many vulnerable young patients as possible, and it seems as if she is already well on her way. Finding “hope in the face of cancer,” Joven & Fuerte is an incredible initiative that Global Cancer Institute is proud to be a part of. For me, it is one of great personal importance as well. As both the daughter and granddaughter of breast cancer survivors, it can be hard not to fret over my future and genetic propensity towards the same diagnosis. Breast cancer is scary, and that fear alone produces stress and uncertainty. Yet my financial security and United States citizenship afford me a certain level of care that others do not have. There are young women in underserved communities all over Latin America that face countless barriers to affordable cancer care an supportive programs. Dr. Cynthia Villarreal and her team recognize the need for organizations like Joven & Fuerte, and their successful implementation of this pilot program in Mexico proves that they can be effective in producing change all over Latin America.